Last season, George Washington had just about the best start of anyone in the country. In just their second game of the year, the Colonials took down then-#6 Virginia and looked to be a lock for the NCAA Tournament. Despite several keys wins later on in the season, including Seton Hall and VCU, GW was left out of the “Big Dance” for the second consecutive year. Of course, loses to DePaul, Saint Louis and Richmond certainly didn’t help their case either. The Colonials received a 4-seed in the NIT, going on to defeat Hofstra, Monmouth, Florida, San Diego State and Valparaiso en route to the title. 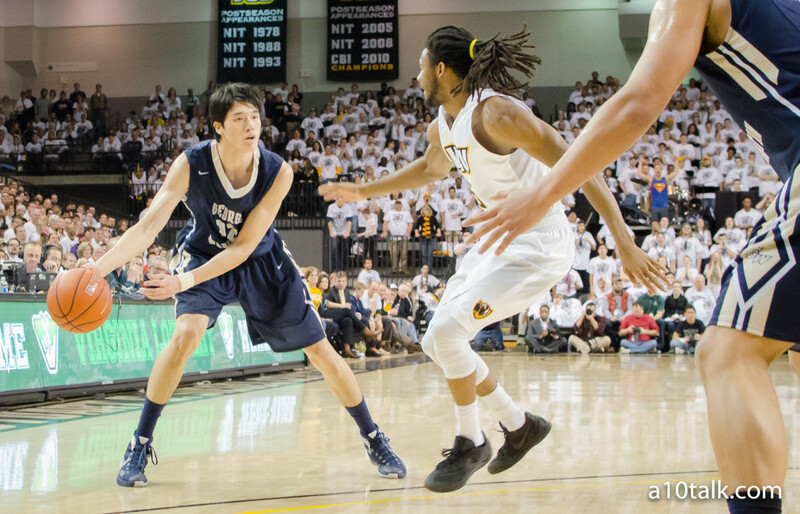 Expectations are high again in Foggy Bottom this season, now GW will just have to deliver. Here are 5 reasons why George Washington could make the 2017 NCAA Tournament. Last season ended with the first postseason championship in program history for George Washington. That experience should aid the returning Colonials in their quest for their first A-10 title since 2007 and their first appearance in the NCAA Tournament since 2014. Last year’s team learned how to step up in key situations, such as Tyler Cavanaugh’s dagger three in the final minute in GW’s win over Florida that propelled the Colonials to the NIT Semifinals. That kind of “clutch-ness” is contagious and is definitely something to look for next season. 2. Mike Lonergan’s “Best” Freshman Class Ever? The spotlight will shine brightly on Player of the Year candidate Tyler Cavanaugh in his final season in Foggy Bottom. After scoring in double digits in every game last season, Cavanaugh will have a tough act to follow, as he looks for an encore in his senior season. Yuta Watanabe will also be asked to carry a considerable load this season, as well as taking a more prominent leadership position. Can the duo’s recent success in the NIT aid them in the upcoming season? Only time will tell. 4. Another Ivy League-Transfer Star? After the success of Dartmouth transfer, Alex Mitola last season, Patrick Steeves will look to fill the void left by Mitola. Steeves, who has 2 years of eligibility remaining, averaged 9.1 points per game last season at Harvard, including 46% from behind deep. It will be interesting to see how Steeves will fit into the GW lineup, along with the six other additions to the GW roster next season. Not to mention Jared Sina being eligible next year could mean eight new members to Mike Lonergan’s squad. Unlike last season, not many people are expecting much from George Washington next season, outside of Foggy Bottom. Much of the hype is being devoted, and rightfully so, to Rhode Island, Dayton and VCU. The Colonials are used to playing the underdog role, and as such, really could sneak up on a lot of teams particularly in A-10 conference play next season. Come check out our forum to talk more about George Washington Basketball!